At Octech Security Services, we specialise in the installation, service and repair of both wired and wireless burglar alarm systems. Committed to delivering a fantastic customer experience combined with a functional set-up that meets your unique needs, our approach to business is professional, proficient and perfectly tailored to you. The backbone of our enterprise is the installation of intruder alarm systems, but we don’t limit ourselves to helping only those whose products have been sourced from us. We also upgrade, repair and service existing set-ups so that anyone who’s experiencing issues can come to us for expert advice and assistance. Should you have any questions or queries, we encourage you to get in touch with our friendly and helpful team for answers. Experienced and expert at what we do, we can provide you with the information you require, as well as a no obligation quote if you’re considering having work done. If you do choose to use us for your installation needs, then we promise to provide a premier customer experience. Dedicated to delivering a quick and straightforward service, we’ll keep mess and disruption to an absolute minimum, so that we can be on our way again in no time, with only a high-quality alarm system left behind to evidence the fact that we were ever there at all. Our commitment to customer service does not end once we leave your house. All of the products we provide come with our on-going support. Should any issues arise, you can contact us at any time for continuing advice, assistance or even a repeat visit to help fix the problem as promptly as possible. We adopt the same approach whether we’re working with those whose alarm systems came from us or those who originally had their product installed by somebody else. Determined to ensure that your equipment is kept in the best possible working order, we’ll make certain that it works when it needs to, to keep your home, your goods and your family as safe as can be. Promising to provide a premier burglar alarm installation service, we really do take your home protection needs seriously. We will only ever offer a customer experience par excellence. Friendly, helpful and professional, we’re always happy to help new clients, which is why we urge you to get in touch with us today. We look forward to talking with you soon. 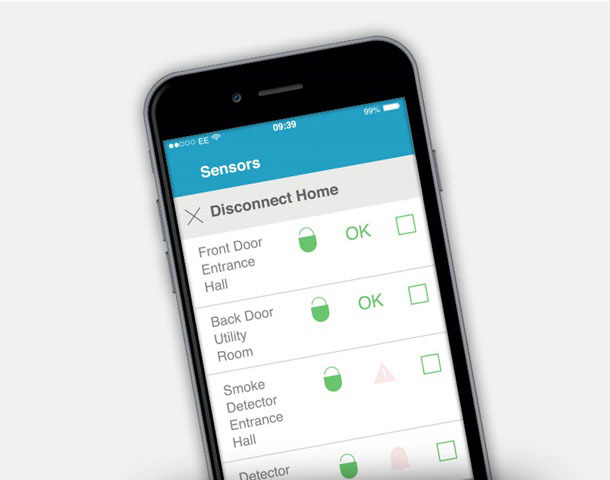 Connecting wirelessly and securely, our intruder alarm control panels can notify, arm and disarm via a smartphone app, from anywhere in the world. We install a comprehensive range of wireless detection to meet any security scenario. A row of LED's keep our back-lit bell boxes illuminated throughout the night.